A dust storm caught by amateur astronomer Paul Maxso of Phoenix, Arizona. On June 23 (top), the storm appears as a bright red blemish on the visible light "RGB" image, just northeast of the planet's center. On June 26, the storm has more than quadrupled in size and is a large blotch occupying the northeastern region of Mars on the "RGB" image. A majordust storm has developed on the red planet, blocking sunlight and promptingMars mission managers to keep a close eye on it, SPACE.com has learned. It is notknown how large the storm might grow, but already it is thousands of milesacross. If it balloons, as dust storms have done in the past,it could hamper operations of NASA's Mars rovers Spirit and Opportunity. For now,officials don?t think the storm will threaten rover operations, however. Infact, the windy conditions on the planet have blown off large amounts of dustfrom the rovers? solar arrays, giving them morepower. The power boost may lend a helping hand to the Opportunity rover,should officials decide to send it into Victoria Crater. ?We?ve beenwatching this storm for about six days now,? said Steven Squyres of Cornell University, who is the lead scientist of the Mars Exploration Rover Project. ?It?snot unheard of for Martian dust storms to cover half the planet, and this oneis now a regional storm.? Squyreswasn?t certain of the storm?s exact size, but said it appears to be thousandsof miles in diameter and ?ain?t no little hurricane.? In fact, ?it?s one of themost sunlight-blockingstorms we?ve seen on Mars,? he said. Accordingto reports from the Mars Reconnaissance Orbiter, which Squyres deemed as Mars?weather satellite, the storm has grown in size and is lifting up dust about 560miles (900 KM) east of Opportunity, which is presently at Meridiani Planum. "The Mars Reconnaissance Orbiter team is watching this closely, because weworry about dust in the atmosphere obscuring the sunlight," Squyres said. Experiencedamateur astronomers have spotted the storm with large telescopes. Paul Maxsonof Phoenix, Arizona, was one of the first to imagethe storm. Dust stormson Mars occur regularly, but seldom do they grow beyond regional proportions. Astorm in 2001, however, engulfedthe entire planet in red dust. ?If thestorm continues to get worse, it could cut into our activities,? Squyres said.One of those activities, should the team decide it?s not too risky, could bethe descent of Opportunity into the massive Victoria Crater. A press conferenceis planned for Thursday to discuss the decision. ?The upshotof all this wind is that the arrays are so clean that the dust is insignificantright now,? he said. 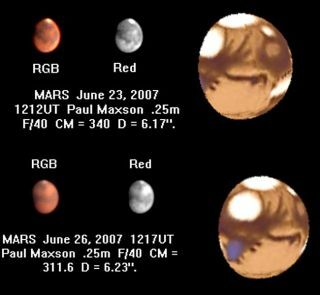 ?But this is Mars, and we can?t predict the weather?we canonly to react to it.? DianaBlaney, the deputy project manager for the Mars exploration rovers at NASA?sJet Propulsion Laboratory (JPL) in Pasadena, California, said dust levels can significantlyimpact the rovers? missions. ?When big dust storms like this come along,they decrease the energy the rovers can work with,? Blaney said. JPLspokesperson Guy Webster said Mars mission managers will be monitoring thestorm?s progress and how it may affect the planned descent into the crater. ?They?ve really been paying attention to the storm and been getting regularreports of its progress,? Webster said.